I have the perfect game day appetizer for you today. 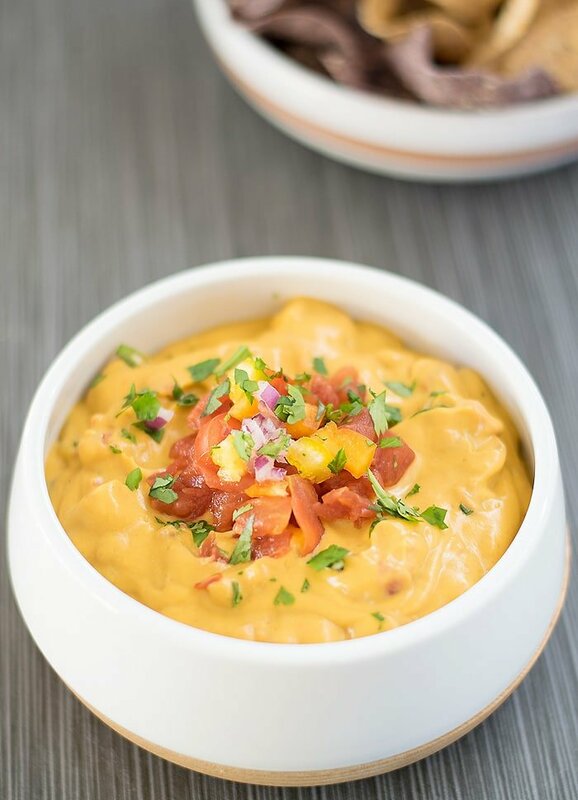 Your friends and family will be excited to eat their fill of this homemade vegan queso. You will be thrilled because they are actually digging into a big bowl of creamy veggies! 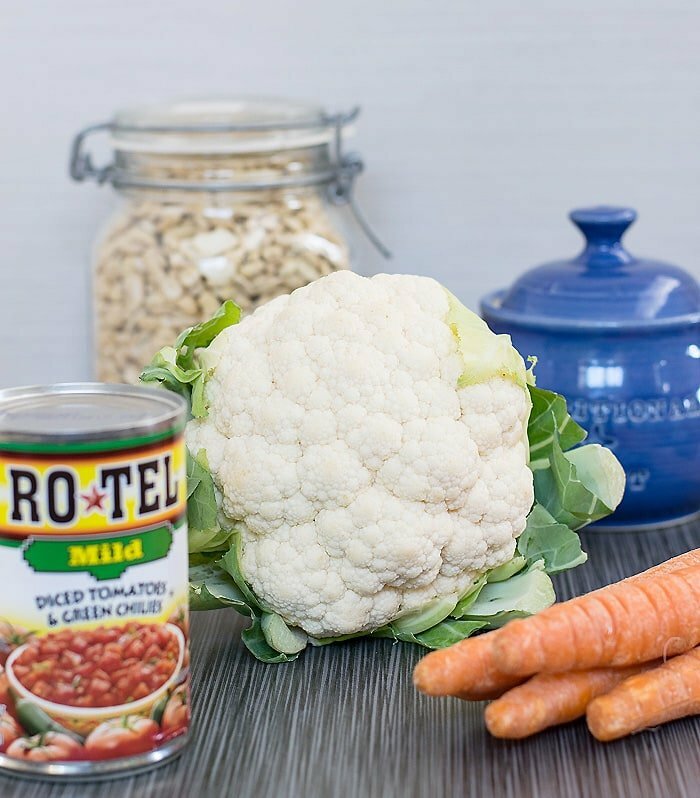 Cauliflower is the surprise main ingredient along with carrots, cashews, and nutritional yeast. 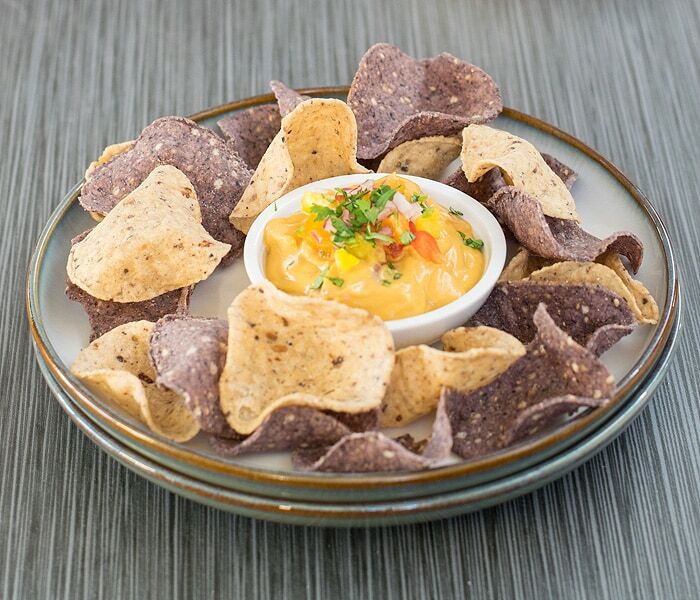 The cashews are what make this queso as creamy as the non-vegan version. 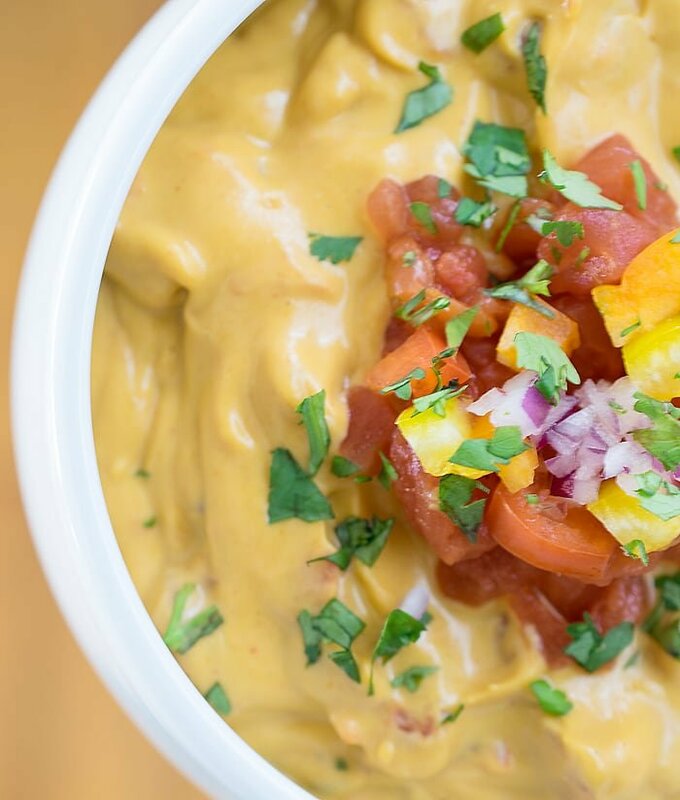 If you’re looking for a fancier vegan queso be sure to take a look at my Vegan Torchy’s Queso Copycat Made with Potato and Homemade Rojo Sauce! The main ingredients of this queso are cauliflower, carrots, cashews, RO*TEL Diced Tomatoes and Green Chilies, and nutritional yeast. Pretty healthy, right? 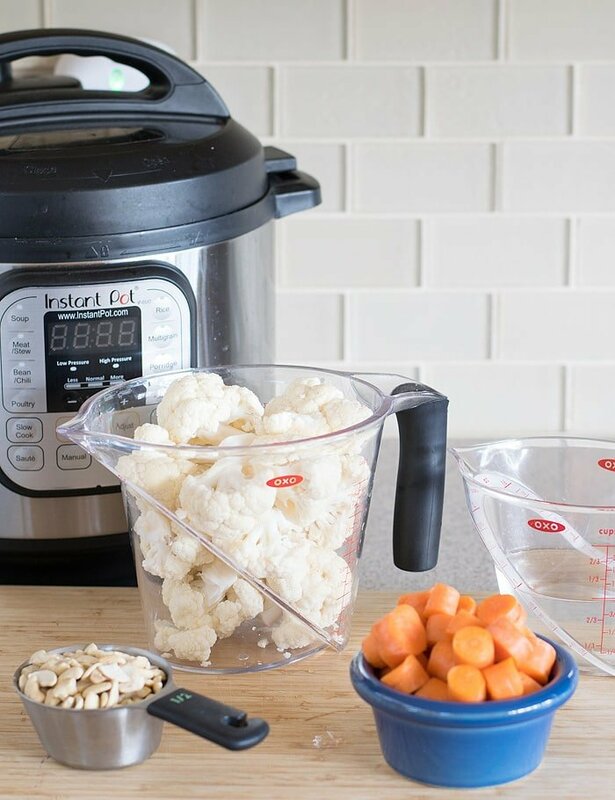 I did my cooking in my Instant Pot, but you could also cook the cauliflower, water, carrots and cashews together on the stove. Just cook until the veggies are tender, then pour into a strainer over the sink to drain the extra water. 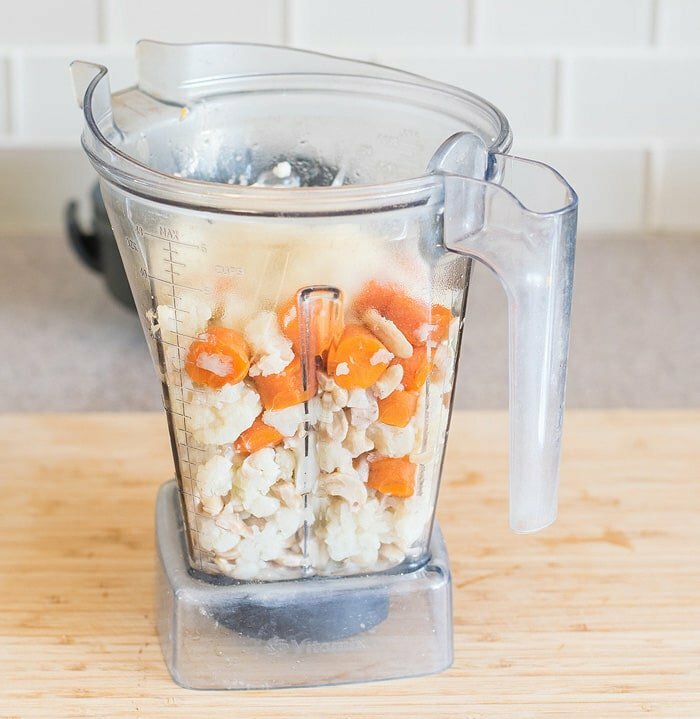 Mostly you are softening the cashews and veggies so they will blend smooth and creamy. Put the drained mixture along with the liquid drained from the canned tomatoes, nutritional yeast, and spices into your blender. It will blend into a smooth and creamy dip that no one will guess is mostly veggies. From here, stir in the drained RO*TEL Diced Tomatoes and Green Chilies plus fresh chopped bell peppers and onions if you want to use them. My favorite mix-in is minced cilantro. To make clean-up easier and chopping speedier, use your small food processor to do all the work on the fresh peppers and onions. Just pulse until everything is minced up the way you like it. Be sure to pay attention though or you’ll end up with veggie puree! 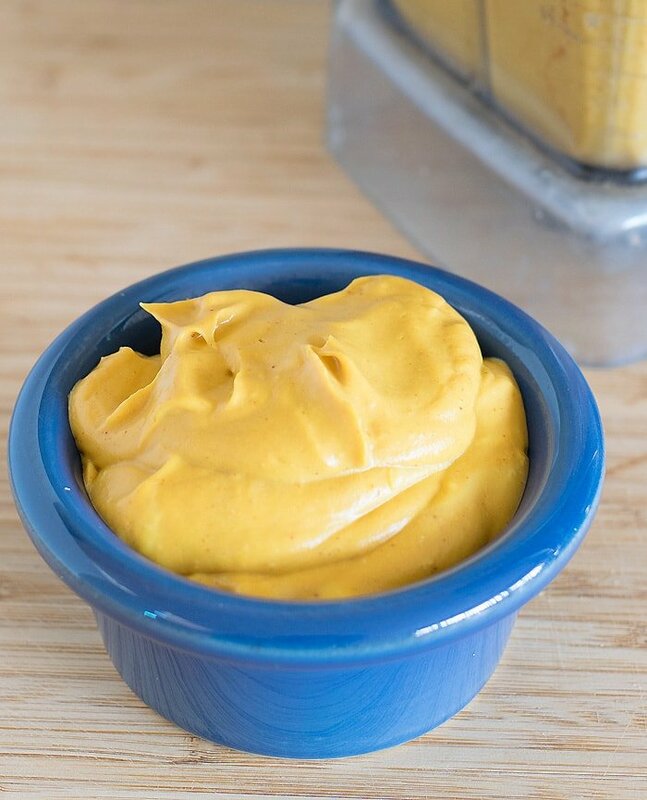 Put the drained mixture along with the nutritional yeast, liquid drained from the canned tomatoes, smoked paprika, salt, chili powder, jalapeno powder, and mustard powder into your blender. This looks so rich! 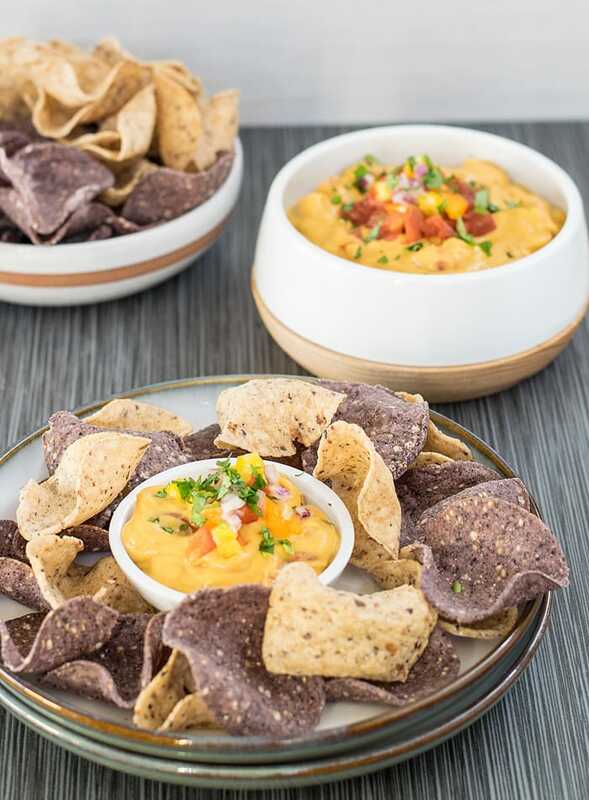 We try and eat clean/paleo, etc most days and I have always wanted to make a similar dip – i love that you used a staple like Rotel for a little kick. I seriously can’t wait to make this! This makes A LOT! Will it freeze, or should I make a half recipe? I’m eating it faster than I thought I would. I think it would freeze ok, but I suspect the cauliflower flavor will be stronger if you do. In other words, make a 1/2 batch. ???? 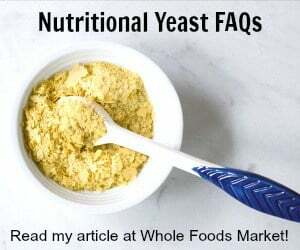 You are going to fall in love with nutritional yeast! Cauliflower was $6.99 a head for conventional here in Nebraska. Any reason I should not use frozen florets? You can totally use frozen cauliflower. It hasn’t gotten that high where I am yet. This recipe looks perfect! Easy, full of vegetables, and lots of flavor! Will be making this for the weekend! Thanks for sharing!!! Totally can’t wait to try this recipe!! My son can’t have any dairy and queso is something that he misses. We’ve tried a couple of versions, but just haven’t found a good one. This look like it might be IT! This looks delicious! I love how sneaky the veggies are! Whoa. I want to put this on everything! I have been known to polish off entire bowls of queso on many occasions. I’m completely fascinated that the consistency of this looks just as amazing as the original inspiration! This looks fabulous. This looks so good – I always love the idea of making cheese sauce with fresh ingredients and knowing exactly what is in there! Just by looking at this I would have never guessed this was Vegan! Awesome job! Looks delish! Yum I need to try this! Looks delicious and perfectly creamy. I am not vegan, but I love vegan recipes and this one looks and sounds delicious. Pinning. Okay so I have made cashew queso before but cauliflower??? this is awesome!!! what a way to make it lower in calories. I am in love!!!! I made a half batch today and it came out delicious! I used the cooking water in a pot of black bean chili and served the chili with a dollop of queso of top. My taste buds went crazy – thank you! This looks really good. I can eat this all day without feeling guilty. Thank you for sharing such awesome recipes. Can you tell me where you get these two ingredients? Lemon Oil for the cheesecake recipe and jalapeno powder for this recipe. I love using quality ingredients when I can. You can get the lemon oil at Sur La Table or on Amazon here . The jalapeño powder can be found at www,myspicesage.com and an Amazon here . I use both of those often. Once you add some jalapeño powder to guacamole you’ll be hooked! We ate it on everything for about 4 days, but you can easily cut the recipe in half. This looks delish, I’m not even vegan but I LOVE cauliflower, so I might give this a go anyway! Made this last weekend as a compliment to vegan tacos and it was incredible! It was just for 2 of us, so I cut everything in half other than the spices. Next time I will probably also use the full 2 cans of rotel. We had more than enough to go with dinner, lunch the next day and more to spare. (Came out really great, much better than I expected honestly!) Will definitely be making this again. Just made this tonight! My grocery store was out of raw cashews and I couldn’t wait for them to restock to make this. Not sure if it effected the consistency. I used cashew milk to thin it out a bit and used only one can of rotel. The color wasn’t yellow like a traditional cheese based queso it was more orange in color. For not following the recipe exactly I am still pleased with how it turned out. It tastes really good (not like carrots or cauliflower). I added a bit of red pepper to give it an extra kick. But my son has a nut allergy. Can I subtitute cannelini beans or sunflower seeds or something else for the cashews? You can just skip them. It makes it a little creamier, but it’s fine with no nuts at all! What is the best way to reheat and not effect the flavor of the queso? Microwave ok? or stovetop better? It is delicious!